Fans are rallying behind singer Chris Brown, who is facing an assault charge after allegedly threatening a woman at his house with a gun. His lawyer claims the allegation is “demonstrably false” – and fans have flocked to social media to support the controversial singer. This isn’t Brown’s first encounter with the law – and with a number of previous, high-profile convictions for violence, why do so many fans adore him? Chris Brown’s violent assault on his then-girlfriend Rihanna in 2009 became one of the biggest stories of that year. Details of the attack in the police report, and the photos of Rihanna’s injuries leaked to the press, led to widespread criticism in the media. But his die-hard fans – who call themselves Team Breezy – say that was an isolated incident and has since been used to sabotage his career and reputation. His probation for the attack ended last year. In the age of social media, Brown’s fans connect with him directly, personally, through his online accounts. In 2009, that was through a YouTube video – since deleted – in which he told his fans he was “not a monster” and to tell his “real fans I love you all”. Now, the star has turned to Instagram as his favoured platform. Some celebrities might suspend their social activity when they find themselves suddenly in the public eye – but as police waited outside his home, reportedly because they were denied entry by Brown and had to wait for a judge to approve a search warrant, he used Instagram to issue messages to his 30 million followers. He complained that “every three months y’all come up with something”. “You’re all the worst gang in the world, the police,” he said, and mentioned the “Black Lives Matter” movement in another. His fans have taken up that call, too, painting Brown as a victim of racial profiling, and suggesting the police response was disproportionate. This type of deep, personal connection to a star is relatively new, according to Professor Chris Rojek from City University London. author of the book Celebrity. Yet while the singer can enjoy the dedicated support of his followers, those on Team Breezy’s bad side can face a difficult time. 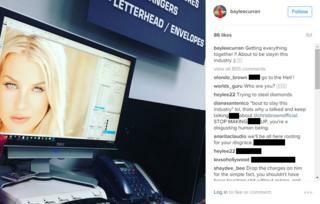 Baylee Curran, the actress at the centre of the story, originally posted a video message to her Instagram account with her version of events. It has since been deleted. Her other posts, however, are inundated with abuse from Brown supporters. “Dumb little ***** … nobody has time for your dumb stories , you just want attention and fame you ain’t gonna have that because your level is zero and his level can’t even be compared with your ******* ugly self !” one wrote in the comments of a photo. Other posts encourage violence, insult her appearance, and accuse her of lying for attention. This aggression, Professor Rojek says, can happen when fandom crosses the line into open celebrity worship. “For some fans, celebs are more important than their families and friends,” he said. “They have a relationship of ‘presumed intimacy’ with them, in which the public acclaim for the celebrity is shared by the fan. This, he said, is no different from religion. Celebrity Worship Syndrome is a psychological condition, where a fan comes to see their icon as “super human”. The behaviour of a small number of Brown’s fans online doesn’t tell the whole picture, however – Brown has also enjoyed the support of world-famous celebrities over the years. “I’m not happy with how things are handled, and how people can take a false story and blow it up into something way more than what it should be,” he told fans. A trailer for an upcoming documentary, billed as “a chance to tell his own story” featured interviews with high-profile stars such as Usher, Jennifer Lopez, Mike Tyson, and Jamie Foxx. Even Rihanna seemingly forgave the singer for the infamous 2009 assault, as the couple briefly dated once again in 2012. They have since discontinued their relationship. Despite the support of fans and friends, Brown’s troubles have had a direct impact on the artist’s career. “Even though Chris Brown will always have a loyal fanbase, he isn’t the hitmaker he once was,” said Radio 1 music journalist Steve Holden. “Some corners suggest he has been unfairly treated in this instance, or that there was some kind of set-up. 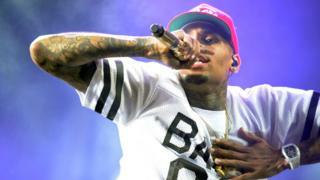 However, for many news outlets and tabloids, Chris Brown is more synonymous with his personal troubles than his music. 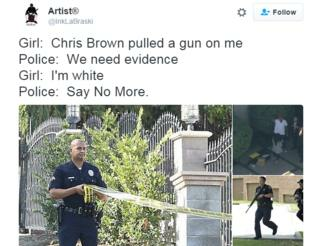 Brown’s convictions have hurt him professionally, too. He has been denied visas to enter the UK and Australia on tour, and his last top 10 hit on the Billboard US Hot 100 was in 2013. Despite the setbacks, however, he continues to make new music for his core fans – who stand by him at every turn.